We’d love your help. Let us know what’s wrong with this preview of Baking Powder Wars by Linda Civitello. To ask other readers questions about Baking Powder Wars, please sign up. I find history truly fascinating, from the changes we can read and see in people, culture, places. One thing that connects us more is none other then food. Food history is just as rich as it showcases the culture impact every day food such as Baking Powder had on us,that today we take for granted. Linda Covitello packs in so much history from the 19th century to today in how Baking Power changed the way we cook and in some cases changed the world. Covitello just doesn't talk about baking power I find history truly fascinating, from the changes we can read and see in people, culture, places. One thing that connects us more is none other then food. Food history is just as rich as it showcases the culture impact every day food such as Baking Powder had on us,that today we take for granted. Covitello just doesn't talk about baking power, but takes the reader along as you see how women, homemakers,bakers and later inventors used to cook before baking powder with old recipes, dairy entries and digging deep into our history from America to Britain and all over. While I truly enjoyed the history, at times I felt that Covitello put a little to much info, making the reading at times a bit slower or something we had to slog through to get at the meat of the matter. This was a double edge sword though. One had to understand this to understand how it effect that. While this balancing act was troublesome, it didn't take away to much from the book overall. For those who love history to cooking, this is a fun book to dig into and learn how something as simple as baking powder changed the world around us. + I was introduced to some very interesting old recipes, and how baking was even understood at that time. I'm a sucker for detail like that! + Loaaaads of mouth watering due to reading about cookies, breads, cakes and other wonders of the world. - The voice is just so boring. At times I felt like I was back in my school desk, reading my homework. - The part about social history or recipes is absolutely fine, but there was also a lot of corporate or even court history. No thanks. Super yawn. A bit out of place on this humble blog as unless I missed something there were no dragons involved in this non-fiction book about the history of baking powder. Nor did any of the major companies involved prone to hiring any type of magical assistance. So feel free to skip this review if the riveting battle between companies trying to sell flavorless white powder does nothing for you. The Baking Powder War caught my eye because I am fascinated by the history of marketing and the blurb promised plenty of this. I was not disappointed on this front but I also got so much more than I expected. This was not a minor marketing battle between rival companies; the 'war' statement in the title of the book was in no way hyperbole. It can also not be overstated just how important the creation and distribution of this product was both in its time and leading up to today. For those that don't cook baking powder is a product that leavens bread. Almost any bread product bought today (outside of artisan loafs) as well as most cakes, cookies, etc contain this product. If you put it in an oven and it gets bigger, or if it is soft and fluffy, you know it has baking powder. If it can be cooked in less than an hour the same statement holds true. Starting with the introduction of bread making in colonial America the author takes her time showing just how important bread making was in the time period; setting up just how revolutionary this simple product ended up being. From there the focus slowly shifts down two paths; how the product was changing society and what four major companies were doing to ensure they profited the most off it. Both of these aspects were fascinating. On the societal change front it is almost shocking how much impact this simple product has. Bread making went from something that went on all day (and took constant prep to ensure the baker had yeast at hand as a dried version is years away still) to something that could be done on more of a whim. This leavening was so important that the first patent issued in America dealt with a baking powder predecessor. Many diverse aspects were looked into, often briefly. The rise of the tin industry (baking pans were suddenly needed for breads that didn't stay self contained), the start of chemical additives to food (baking powder is convenient but it adds neither flavor nor nutritional value) and eventually the rise of chain grocers. But the majority of the book focused on the cut throat war the various companies engaged in during a time with less ease of consumer information. Wholesale bribery of state legislature type of warfare; these companies were robber barons every bit as crafty as any steel tycoon. Early marketing was as horrifying as it is fascinating; one ad basically told women that a can of baking powder saved so much time it was like owning a slave! I don't review non-fiction much and this certainly isn't an academic journal. Unlike fiction reviews I don't see any need to discuss pacing or narrative style. I found The Baking Powder War to be easy to read and completely fascinating. I was expecting more on marketing and was slightly disappointed that it only came up sporadically but I got so much more than I realized from this book. Recommended for those interesting in marketing, American history, and the quality of their food. I think that Linda Civitello must have dreams about biscuits and baking powder. Wow. What an incredible amount of research she has done for this book. Baking Powder Wars was published by the University of Illinois Press. In my experience, books published by a university press can be a bit dry and more academic than a casual reader is looking for. This book starts out that way, as the first few chapters set up the cooking rituals of pre-baking-powder America, its not inaccessible but it's pretty I think that Linda Civitello must have dreams about biscuits and baking powder. Wow. What an incredible amount of research she has done for this book. The research is impressive and the tactics described are astounding. I had no idea baking powder was such big business. The more I read, the more I enjoyed it, and I appreciate the amount of information the author shares about the families that were behind many of the big companies at war with one another in the 19th & 20th century. They started off small and built an empire that went beyond the single product. I received an early copy of this book via Netgalley. I have a deep interest in 19th century history. It provides the background for several of my novels. I'm also a food blogger and all-around foodie. I am endlessly fascinated by the role of food in book world-building and in our own history. Therefore Baking Powder Wars is perfect for me. At times, it's confusing because of the sheer number of names, but it never ceases to be interesting. The book begins with a discussion of leavening ingredients I received an early copy of this book via Netgalley. What really interested me, though, were the cultural ramifications of baking powder. It obviously freed women from the kitchen and the hours and days it might take to create yeast bread, but baking powder also became integrated in different cultures and regions of the United States, and gradually changed traditional recipes to become baking powder recipes. Southern-style biscuits are a prime example of this. As baking powder became a symbol of modernity and civilization, it also played a part in controlling Native Americans on reservations (baking powder and flour were allotted to them, and became part of the reservation food Indian fry bread, which didn't exist before then) and perpetuating racist stereotypes of blacks through the 1930s and onward. GNab I received a free electronic copy of his history from Netgalley, Linda Civitello, and University of Illinois Press in exchange for an honest review. Thank you all, for sharing your hard work with me. I am old, and I have always dearly loved to cook. I am so old that I remember when every country road we traveled had Clabber Girl ads painted on old barns. One of my main complaints when I was a new cook in the late '50's and early '60's was the lack of any sort of consistency in recipes that GNab I received a free electronic copy of his history from Netgalley, Linda Civitello, and University of Illinois Press in exchange for an honest review. Thank you all, for sharing your hard work with me. I am old, and I have always dearly loved to cook. I am so old that I remember when every country road we traveled had Clabber Girl ads painted on old barns. One of my main complaints when I was a new cook in the late '50's and early '60's was the lack of any sort of consistency in recipes that included a leavening of any sort. As you cook, over the years, you make up your own rules, as did the ladies and gentlemen who wrote the receipt books quoted in this fine history of baking powder and cutthroat advertising. And thanks to the baking powder wars our quick breads, cookies, muffins and biscuits are dependably great every time we make them. But I knew all that when I picked up this book. Let me start by saying that I have been in the culinary world for many years now - as a culinary student, professional baker, owner of an Italian restaurant and catering business. So when I had an opportunity to read Baking Powder Wars: The Cutthroat Food Fight that Revolutionized Cooking by Linda Civitello, I jumped at it! I know that baking powder may not be at the top of your reading list, and you are probably saying to yourself, "what could be so fascinating about baking powder?". Believe me, Let me start by saying that I have been in the culinary world for many years now - as a culinary student, professional baker, owner of an Italian restaurant and catering business. 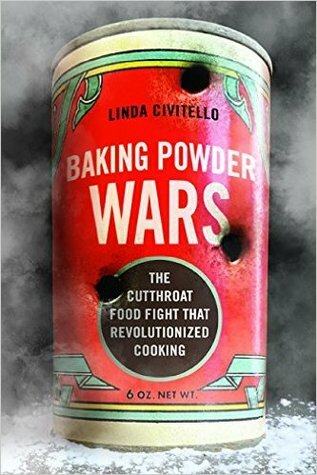 So when I had an opportunity to read Baking Powder Wars: The Cutthroat Food Fight that Revolutionized Cooking by Linda Civitello, I jumped at it! I know that baking powder may not be at the top of your reading list, and you are probably saying to yourself, "what could be so fascinating about baking powder?". Believe me, after reading this book you will definitely change your thoughts on that subject! Linda Civitello takes us on an in-depth journey of how hundreds of companies fought for market control, mainly talking on the 4 main companies we all know - Rumford, Calumet, Clabber Girl, and Royal. From the Publisher: She also tells the war's untold stories, from Royal's claims that its competitors sold poison, to the Ku Klux Klan's campaign against Clabber Girl and its German Catholic owners. Baking Powder Wars: The Cutthroat Food Fight that Revolutionized Cooking is a well-researched, entertaining, and a beautifully written book that any baker, food historian or anyone in the culinary industry should read! I read this book from NetGalley for an honest review. I had absolutely no idea what on earth to expect when I began "Baking Powder Wars." So to put it almost criminally lightly, I was surprised to learn that the history of leavening agents in the United States is a tale more fascinating than I ever could have possibly imagined, with everything from ferocious competition across the country, to marketing and advertising innovations that are widespread today, to episodes of full-out government corruption. Much more general history than I'd have thought winds around the baking powder history. Entertainingly written with a wealth of well researched information. It may have helped that I've baked for many years and so could empathize with bakers' struggles before baking powder. And I've also read lots of food history. But this is so well told that I think you don't have to be a baker to appreciate this book. This book was fascinating! I had no idea how contested the baking powder market was so hotly contested and viciously fought over. This book was full of information and I know more about baking powder's history than I realized there was to know. It was interesting to see the rise and fall of the different companies and types of baking powder and how they fought for their share of the market. Food-related microhistories are my jam. Loved the anecdote about abolitionist cookbooks. I got this as an e-arc from Netgalley for an honest review. I enjoyed it...I mean, I freaking LOVE microhistories, but it did drag a bit in some places. If you like microhistories or food history, you need to pick it up though. Who knew the baking powder biz was so cutthroat? If baking powder doesn't seem substantial enough to merit an entire book, that's only because its history and background have not been widely explored and remain generally unknown. Linda Civitello's carefully researched book has finally opened a window onto a fascinating subject and era in US history. The book is interdisciplinary in nature, shedding light on the science and chemistry behind baking powder, the international exchange of ideas and scientific knowledge that enabled the powder's dev If baking powder doesn't seem substantial enough to merit an entire book, that's only because its history and background have not been widely explored and remain generally unknown. Linda Civitello's carefully researched book has finally opened a window onto a fascinating subject and era in US history. The book is interdisciplinary in nature, shedding light on the science and chemistry behind baking powder, the international exchange of ideas and scientific knowledge that enabled the powder's development, the history of chemical leavening agents, politics and corruption, suspicion of foreigners (in this case, Germans), and insights into the role baking powder played in the economic history of the US, as well as marketing, feminism, and social issues. I found especially interesting the book's exploration of how baking powder revolutionized women's lives, freeing them from the necessity of spending long hours kneading and baking bread for their families. The popularity of baking powder in the US also explains how baking styles here developed differently from European baking--US cooks relied much more extensively on a chemical leavening action, while more traditional European cooks relied on beating bubbles into the batter and using eggs as a leavening. This difference created new American baked goods such as cookies, quick biscuits, cobblers, and light fluffy cakes. Years ago, at a party, when a friend of a friend, as a comment on the ridiculous minutia of academia, related that a friend of that friend was writing a dissertation on the history of the bouillon cube, I said, "How can I get a copy?" So you will not be surprised to hear that within the past year, I was flipping through a newly-acquired 1938 edition of the Rumford Baking Book and remembering that I also had Royal's 1920s Any one Can Bake, a 1917 Ryzon Baking Book, and a 1930s volume from Golden R Years ago, at a party, when a friend of a friend, as a comment on the ridiculous minutia of academia, related that a friend of that friend was writing a dissertation on the history of the bouillon cube, I said, "How can I get a copy?" So you will not be surprised to hear that within the past year, I was flipping through a newly-acquired 1938 edition of the Rumford Baking Book and remembering that I also had Royal's 1920s Any one Can Bake, a 1917 Ryzon Baking Book, and a 1930s volume from Golden Rule Foods in my collection of branded cookbooks. "This was big business indeed, to have all put these out," I thought. "Someone," I mused to myself, "should write a book about the history of baking powder." I may have shrieked with actual delight when I discovered Linda Civitello had. Obviously I enjoyed this immensely. Before there baking powder was invented, there were no fluffy cakes, no cookies, no muffins, no biscuits, and no quick breads. Everything had to be leavened with yeast, and since there was no dried yeast available at the grocery store, the baker had to capture and store their own live yeast, as one does sour dough starter these days. It was a lot of work- building up a starter, kneading, and allowing bread two or three rises took a day and a half. There were yeast raised pancakes and biscuits, j Before there baking powder was invented, there were no fluffy cakes, no cookies, no muffins, no biscuits, and no quick breads. Everything had to be leavened with yeast, and since there was no dried yeast available at the grocery store, the baker had to capture and store their own live yeast, as one does sour dough starter these days. It was a lot of work- building up a starter, kneading, and allowing bread two or three rises took a day and a half. There were yeast raised pancakes and biscuits, just like there are sour dough versions of those today, but they weren’t fast and no one baked something on the spur of the moment. Baking powder- even those made at home- changed all that. Now you could bake something in an hour- and the texture was totally different. This book- which actually reads like a thesis and I do wonder if that was its first incarnation- shows the history of the various mixtures used as baking powder. It also shows us the war between the various large sellers of baking powder- it was surprisingly nasty. Today, with all the mixes on the shelves and all the pre-made baked goods available, one wouldn’t think there would be big money in simple baking powder, but there was. The first baking powders were homemade, where the home baker combined various ingredients to create a leavener. Some formulations had to be done immediately before baking because moisture caused them to go off right away. Some formulations were double acting- they started giving off gas when mixed with moisture, and were triggered again by the heat of the oven (or the griddle, if making pancakes). Some had aluminum- something many of us cringe at today. Because there were several formulations, cookbooks had to include tables showing what changes had to be made for the different types and brands. All of this experimentation was made in people’s homes, not in labs. This is a great social history book. Baking powder really did change the way we eat. It didn’t change bread, but it did make a whole new world of baked goods available. And one could make quick breads with it, even though those don’t make great sandwiches- the crumbly texture of baking powder breads makes them fall apart easily whereas yeast breads stay together because of the springy texture of gluten. There was a lot about the wars between the companies manufacturing the various baking powders that I found myself skipping. The book is incredibly detailed; the author did a lot of research in original records, in both the economic field and the social. If you’re interested in how life was lived in the past, it’s a great book, albeit over long at times. Four stars out of five. I admit to not knowing much about baking powder because I am not a big baker. I like to eat baked goods, but if I'm going to bake something, there's a good chance that a mix will be involved (not even a baking class helped). But, I like reading and eating so food history is something that I am interested in reading. The only thing is, I don't really find many books about this topic. Baking Powder Wars fills a little gap in my huge chasm of ignorance about the history of food. Although it starts o I admit to not knowing much about baking powder because I am not a big baker. I like to eat baked goods, but if I'm going to bake something, there's a good chance that a mix will be involved (not even a baking class helped). But, I like reading and eating so food history is something that I am interested in reading. The only thing is, I don't really find many books about this topic. Baking Powder Wars fills a little gap in my huge chasm of ignorance about the history of food. Although it starts off as a history of baking and the troubles that women have traditionally had making bread and other baked goods, the bulk of the book focuses on the companies that made baking powder. Basically, baking powders were marketed as ways for women to successfully make bread and other things involving yeast with much less effort, and in an age where a women's abilities were (at least in part) measured by how well they baked, this must have been a lifesaver to them. But since it was so new, how could they figure out which brand to buy? And this is how the marketing wars began. From what I understand, the big companies used different types of baking powder - phosphate and aluminium and they used every way they could to exploit the difference for their own gain. To be honest, I found the marketing aspect a lot less interesting than the history of baking (whoops, not being a very good economics student here). I found the recipes and the snippets of how life was for women back then fascinating and if anyone knows a book that focuses on that aspect, please let me know! I would recommend this to people who are interested in the history of brands and the (relatively) unknown history behind everyday products. If you're interested in marketing and brands trying to get favourable legislation passed, you'll love this, but even people who are just interested in the cooking will find something to like (mainly at the start of the book, but there are snippets everywhere). NetGalley ARC | This was interesting, but hampered by a clunky style and some poor presentation of good research. | The story being told here is definitely worth the time Civitello took to research and write about it. I had read about previously about Pure Food fights in Swindled: From Poison Sweets to Counterfeit Coffee—The Dark History of the Food Cheats, but this was focused on just baking powder, which is a draw all on its own. The further I read the more I enjoyed it, as the author seemed t NetGalley ARC | This was interesting, but hampered by a clunky style and some poor presentation of good research. | The story being told here is definitely worth the time Civitello took to research and write about it. I had read about previously about Pure Food fights in Swindled: From Poison Sweets to Counterfeit Coffee—The Dark History of the Food Cheats, but this was focused on just baking powder, which is a draw all on its own. The further I read the more I enjoyed it, as the author seemed to settle into her voice as the book went on, but the beginning nearly lost me. The introduction felt like a clunky Master's thesis, continually using the "this document will show" style that is inappropriate for a mass-market book. It also seemed a bit unsure as to whether the purpose was a history of a product or a deeper look at American feminism as felt in the kitchen. Throughout the Introduction and Chapter 1, the transitions were abrupt, which made the book easy to put down, and then I came across a sloppily-presented fact. Civitello states that in "1840, New England women's literacy was at 100%". That particular number is always going to catch the eye. It seemed, frankly, unlikely. So I checked her citation, then found the book she got the fact from on Google books. It was a book written in 1977, and it stated, instead, that "virtually all" women in 1840 New England were literate, which is not the same as 100%. In turn, that book's citation for the fact, a 1974 book, used the phrase "almost all", again, not the same as 100%, and it turns out that the true literacy rate in New England in 1840 was between 91% and 97%. Look, I know this makes me sound like a pedant. I don't actually care what the literacy rate was in that area at that time, the point is that it's poor scholarship and it calls attention to itself with the unlikely number presented. That makes me less trusting of the author. Then I got to Chapter 2, where she stated that "in the nineteenth century...the United States didn't have a wine industry". Except that we did. The first commercial winery in California opened in 1857 after 3 centuries of monastic CA wine growing. Cream of tartar had been available in the US since before there was a US. That the baking powder executives of New England and the Midwest didn't think to source from the newly-settled and still wild and distant west coast is not the same as if the product did not exist. If you bake, then you’ve probably used baking powder at some time or another. If you are a serious baker then the story behind baking powder is a fascinating one. I know, I know… I see the look you are giving me. But trust me, it really is. I wasn’t prepared for such a fascinating tale. I thought I’d get a dry, hard to swallow, I need some milk to wash this down type of book…but instead I was delighted by its layered goodness. The amount of research that went into this book is beyond comprehensio If you bake, then you’ve probably used baking powder at some time or another. If you are a serious baker then the story behind baking powder is a fascinating one. I know, I know… I see the look you are giving me. But trust me, it really is. The amount of research that went into this book is beyond comprehension. Who would have thought that this little product could cause so much upheaval? What I enjoyed about it was all the historical aspects. Those nuggets of information sometimes blew my mind. The book explains how the simple muffin has changed since we use a leavening agent. It tackles the advertising industry and their feuds and dives deep into the history of bread making. I’m very interested in how the kitchen has changed throughout history. If you spend a considerable amount of time with mixing bowls and measuring cups then Baking Powder Wars should be right next to your cookbooks. Baking powder has been such a staple in our modern lives that we might easily forget that there was a time without such a small luxury. Author Linda Civitello has obviously done the time and research when it came to writing this book. That being said I found it a bit difficult to dig through. I’ve noticed that when it comes to nonfiction books I still enjoy the narrative approach to the type that reads like a text or essay one might do at school. The sheer amount of research and information tha Baking powder has been such a staple in our modern lives that we might easily forget that there was a time without such a small luxury. Author Linda Civitello has obviously done the time and research when it came to writing this book. That being said I found it a bit difficult to dig through. I’ve noticed that when it comes to nonfiction books I still enjoy the narrative approach to the type that reads like a text or essay one might do at school. The sheer amount of research and information that Civitello was able to discover and bring to the forefront in this book is astounding. Yet it feels like in order to justify the amount of time and effort, she included everything she found, even some things that really didn’t make much sense to me. This book presents an in-depth history of baking powder from Europe to the new colonies to 21st century America. What an interesting product, with historic and current recipes provided. The author's statement that it created a paradigm shift and then dropped out of pubic consciousness is so true. I had to go check my cupboard to find out what brand of baking powder I have (Clabber Girl) and can not recall having made a conscious choice to purchase that brand. Industrial espionage, advertising wa This book presents an in-depth history of baking powder from Europe to the new colonies to 21st century America. What an interesting product, with historic and current recipes provided. The author's statement that it created a paradigm shift and then dropped out of pubic consciousness is so true. I had to go check my cupboard to find out what brand of baking powder I have (Clabber Girl) and can not recall having made a conscious choice to purchase that brand. Industrial espionage, advertising wars, anonymous testimonials, price undercutting, worker layoffs, government regulation, deregulation... It all appears in the baking powder industry. Very enlightening. Only lost a star because some of the information got off topic. Who knew that a little tin of (innocent) white powder could cause such a stir in the culinary world. It involved unscrupulous business men, out to make a fast buck, Presidents and even the Ku Klux Klan. It's amazing that anything that is of help to people most times gets hi jacked by others wanting a piece of the action (and a piece of the cake!). The Brands mentioned in the book I don't know of as I don't think they made it to the UK, but I might be wrong there. Next time I make my scones etc., i w Who knew that a little tin of (innocent) white powder could cause such a stir in the culinary world. Next time I make my scones etc., i will think about all that this very useful foodstuff has gone through! I don't recall how I happened upon this book but I'm glad I did. When I saw a book about baking powder I had no understanding of its history. Civitello does a good job walking us through the history of the importance and use of baking powder and other leavening agents through the years. We find out about the link between bread making, morality, religion, and how tied women were to that work. Money and political bribery. How women's lives and perceptions of the change by the power brokers behind t I don't recall how I happened upon this book but I'm glad I did. When I saw a book about baking powder I had no understanding of its history. Civitello does a good job walking us through the history of the importance and use of baking powder and other leavening agents through the years. We find out about the link between bread making, morality, religion, and how tied women were to that work. Money and political bribery. How women's lives and perceptions of the change by the power brokers behind the different companies controlling baking powder. The lies and manipulations of advertising and laws for money. This book is an extraordinary example of well-reseached approach of food history. Either you consider the anthropological, economic and even culinary aspects of the history of baking powder, each layer is extraordinary reach. The author's merit is to offer a fantastic overview and in-depth analysis of an everyday topic. A recommended book to anyone interested in the history of mentalities and food historians. Overall, I enjoyed this book, and would recommend it. I love books about the history behind everyday things you take for granted (e.g. Salt and Cod). This is one such book, and the author does a very good job of in this extremely thorough book. A wide number of issues were looked at from some interesting vantage points, including native American, advertising, industrial espionage, chemistry, and legislative. All in all, a very thorough piece of work. What I didn't like Overall, I enjoyed this book, and would recommend it. At the early stages of the book, the academic thesis is laid out pretty bluntly - gender studies is at the core of this title. Personally I am not a fan of this school, as I prefer less theoretical and more journalistic styles of work - particularly when it comes to history. But, as it is a boook through a Universty Press, it's inevitable that it's going to have an academic bent. I really enjoyed this. It can be a little dry, but it uses baking powder as a lens to discuss the experiences of women in American history -- from housewives who didn't want to spend all day baking, to how racism was codified in our food. Baking powder also manages to be involved in lawsuits that went to the Supreme Court, overthrew a governor, and involved at least two presidents. Really interesting. Another well-researched academic work with crossover appeal to the popular audience. Although I was interested in the topic and learned a great deal, if I had been the editor, I would have cut or trimmed several sections and consigned more of the details to endnotes. Not compelling enough for the average reader. An intriguing history of a household staple. Scandal, bribery, espionage, fake news, cutthroat advertising, racism, the Supreme Court, the Good Housekeeping Seal of Approval, and the Indy 500, all packed into that little can in your pantry.